Available for interviews / sessions / concerts"A class act "( Maverick magazine)American singer-songwriter CATHRYN CRAIG and accomplished British guitarist BRIAN WILLOUGHBY create an intimate atmosphere with songs about life experience, coupled with amusing anecdotes. The duo are on British roads once again delighting 'live' audiences with their unique musical partnership, dipping into their shared and solo recorded catalogues "
Their "Anglicised Americana" blurs music boundaries, showcasing Cathryn's voice and Brian's guitar and their intricately crafted songs in a unique and dynamic way. Brian's guitar playing has drawn breathless reviews such as this from Guitar Techniques for his "Fingers Crossed" release: "This is inspirational stuff indeed, filled with ideas and bursting with encouragement for every guitarist". Guitar & Bass magazine went further - "A consummate piece of work that successfully bestrides just about every boundary." Responses to Cathryn's work have attracted equally sharp observations, Country Music Radio calling her work "pure and intimate", whilst Q magazine described her "Porch Songs" album as having "...a bottle not seen since Ralph McTell's 'Old Brown Dog'. Four Stars"
Cathryn has sung with The Righteous Brothers, Shel Silverstein (Dr. Hook & The Medicine Show), Jorma Kaukonnen (Jefferson Airplane, Hot Tuna) and Bobby Bare, while BRIAN has played for Mary Hopkin, Roger Whittaker, Joe Brown, Jim Diamond and Monty Python and was lead guitarist with Strawbs for 25 years. The couple have both worked with international Folk star Nanci Griffith. 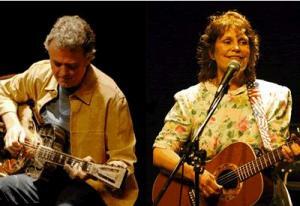 CD releases include three solo albums by Cathryn, two from Brian and the duos "I Will". Their "Alice's Song" was recorded by Strawbs as a single, for The National Autistic Society's Year of Awareness. "Rumours of Rain", in aid of children who are victims of war, features the duo with the pupils of Askam Primary School, accompanied by members of Steeleye Span, Lindisfarne, Fairport Convention and Pentangle.